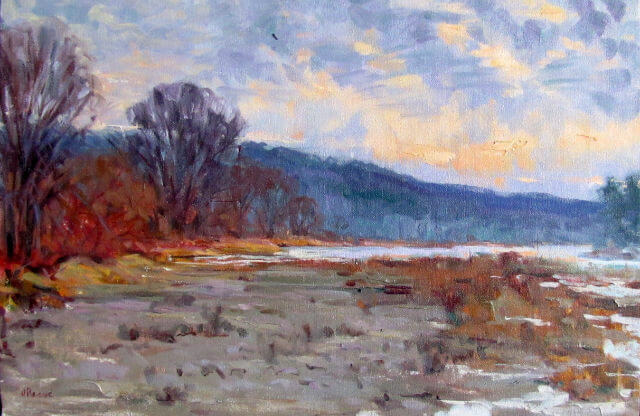 Yesterday, I was finally able to return to a landscape painting begun about 4 weeks ago.The site of this painting was on an isthmus, running north to south, parallel to the shore line of the Delaware river near the town of Cochecten. The day after I had begun this painting, the river flooded and this isthmus was under water for about a week. All the river grasses, which were in the foreground of the painting were pulled down river to the south or were removed entirely. It took about two weeks for the water to recede enough that I could get back on this peninsula which temporarily had become an island. On my return to the site yesterday, I found the isthmus as I thought I might- Many grasses were washed away and the stones themselves were all pointing north, their faces buffeted by the strong currents. I was left with no option but to reconfigure this painting and re-approach it as a new experience. It was a wintery cold day, overcast but not entirely. The clouds were shifting diagonally and allowed some of the early morning light to penetrate. There was no wind but the river was moving surprisingly fast. As I stood there, ice floes- semi-transparent, were floating past and as the day warmed I could hear the crunching of the ice hitting the near-by bridge. This was followed by a surprising loud ripping sound as large chunks of ice broke free from the shoreline. Erie and awesome sounding. A moment to reflect on nature’s independence and inherent force. I can only imagine the power of nature that Monet experienced, but even in my small way I felt the awesome beauty of the moment- alone and immersed in an elemental nature, free from any human presence. I felt transported, able to grasp in a new way this environment and hence my painting. Only in such solitary moments can one experience profoundly a new reality. Monet’s paintings reflect this separation from the world of human affairs and in this isolation one can sense only the presence of the artist- present with himself in this new experience of reality. Landscape paintings that reflect, not only the the natural elements that lie before one, but also mirror the artist’s interior world- reflecting the correspondence that lies between the artist and nature, are the most profound. The painting becomes a conduit or isthmus between the natural forces and the artist’s own interior experience of the moment. When a painting is re-formed it reflects this “new” self. Although, I lost the brooding sense I originally had in my painting, it has re-emerged with clouds parting and a clear path to an ever- flowing river- renewed hope for a new year. It is an added pleasure to read about your experience with this painting while viewing it. I especially like the sun trying to break through the clouds.